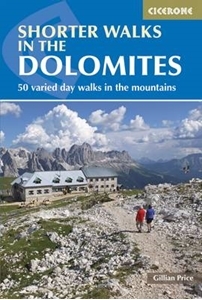 Shorter Walks in the Dolomites is Gillian Price’s Cicerone guide to a selection of the best rambles in the mountains of northern Italy. The walks range from Nova Levante in the west to the Austrian border and the guide covers a range of walks varying from short strolls to full-day expeditions and includes both high-mountain and valley walks. A system of reliable cable-cars and lifts allows walkers to extend the range of short routes that are possible to walk. This guidebook includes 50 day walks ranging from short 3-mile strolls to full-day expeditions and there are opportunities for walkers of all abilities, from high mountain walks with strenuous climbs for experienced walkers to leisurely family strolls. The walks will take you through landscapes of vast forests, high-altitude rockscapes and seas of wild flower. Each walk has an Information Box providing details of walking times and distance, difficulty gradings, ascents and descents, starting points and the relevant map. A detailed introduction gives practical guidance on when to go, getting there, local transport, recommended maps, weather and forecasts, protected areas and wildlife and vegetation. Detailed walk descriptions are accompanied by colour sketch diagrams mapping the route in addition to colour photographs illustrating some of the highlights of the Dolomites.